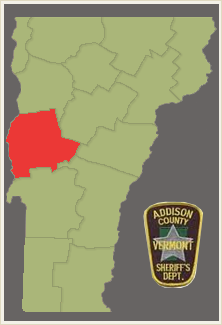 The Addison County Sheriff Department was established in the late 1700's and has been at it's current location since being built in 1845 to include a jail. The jail had been in continuous operation from 1845 until 1971. The jail was re-opened in the mid 1980's and closed after the expiration of a federal contract in May of 2011. Since then, the space has been renovated and is home to the Addison County Unit for Special Investigation. The Addison County Sheriff Department currently has 17 full and part-time Deputies serving the Addison County Community.